Today is International Women’s Day and just like last year, L’Occitane has released another Solidarity Balm that goes right along with it. This year’s balm is Shea Butter Violet and it smells amazing. I was first introduced to the yearly Solidarity Balms last year with the rose scent. I literally use this stuff for everything; lips, cuticles, scrapes, chapped and broken skin. I haven’t found a limit to what I can use it for and I still haven’t finished last years. I love nearly anything rose scented so for me to love this violet scent even more in unprecedented. What I love even more about the actual balm is that L’Occitane will use 100% of the profits to fund NGO’s projects to support women’s leadership in the world in partnership with UN Women and the L’Occitane Foundation. Not all of us can or will participate in women’s marches around the world but we can all try and spend $6 on this balm to try and support other women. You’ll probably want to pick up more than one though because the Solidarity Balms are amazing and you’ll feel like you’ve contributed a little. 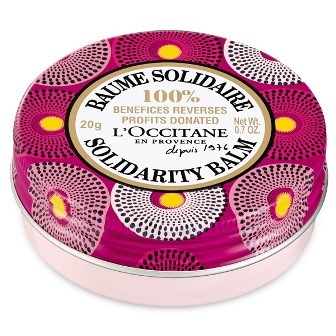 You can find the Solidarity Balms on sale on the L’Occitane website.